Easy Deposits By Phone Deposits are easy and can be charged by SMS direct to the mobile phone bill. Why Play at The Phone Casino? The Phone Casino is a mobile-focussed casino operated by Small Screen Casinos Ltd. It carries licenses in the UK and Alderney, and while it has a heavy focus on UK players (English language, UK licenses) it caters for mobile gamblers in other countries too. There are around 250 games on the mobile platform, all accessible via the user’s web browser. If you like easy-to-follow lobbies on your mobile, The Phone Casino is perfect. You sign in with just your mobile number and password (no annoying usernames to remember), and most games have an information (‘i’) button so you can get details like game volatility and RTP% fast. There are also play-money versions of many of the site’s slots. Setting up an account is easy. Enter your mobile number and an activation code is sent by text. It’s a nice bit of added security to prevent anyone setting up in your name. You can also set up a deaily deposit limit before registering. 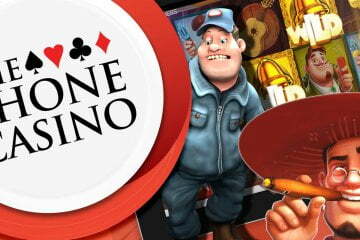 The Phone Casino is currently running a welcome bonus worth £1500 (spread over five deposits). Free spins are also added on selected games when you sign up – and added every day after you join. A Refer-a-Friend bonus awards new sign-ups with £10 and yourself with £25. Other free spins rewards are available for players, even if they deposit the minimum of £3-5. Rewards are locked until the previous reward has been achieved, however. It’s always worth comparing the desktop and mobile versions of casinos to see what games are available. And that’s where The Phone Casino scores highly in our ratings. There are over 210 slots in the mobile casino client at The Phone Casino (compared to 290 on the desktop option), and even the blackjack (9 vs. 16) and video poker (16 vs. 37 in the online version) games have plenty of variants. The range of software developers isn’t massive, but there are some interesting titles from the likes of Saucify and Thunderkick. Many games are exclusive at this casino. Deposits are easy (just tap the simple amounts – £2.50, £5, £10, etc) and are charged by SMS direct to the mobile phone bill. If you want to use more traditional methods, and load up higher amounts, VISA and MasterCard are available plus Skrill and paysafecard vouchers. Although not 24 hours, they have a UK support line and a helpful email customer service option. Opening hours are a little erratic, however – 9am to 10pm on weekdays and noon to 8pm on weekends. Although you won’t find too much in the way of Microgaming branded slots or big-money progressives, The Phone Casino is a fun place to experience hundreds of games from the smaller developers. The initial welcome bonus is big but the regular promos really favour the slots players. Connoisseurs of left-field developers like Saucify sign up now.